"'Twas the day before Christmas and Santa was ill. In the cold winter wind he had caught a bad chill." What will Santa do? He will call Pete the Cat to help him out, of course. Pete hops into his bus and drives on up to the North Pole to help Santa check his list and get the presents loaded up for all the girls and boys. He gives it his all and delivers all of the toys in the nick of time. 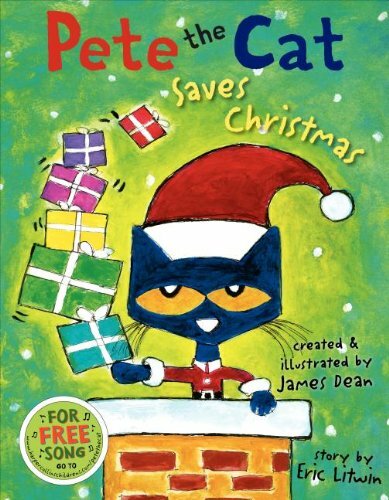 In Pete the Cat Saves Christmas written by Eric Litwin and illustrated by James Dean, kids of all ages will receive a positive message about giving your all during a seemingly impossible task. What I like best about the book is the free Pete the Cat song and story download available from Harper Collins. If you enjoy this book, you may just want to check out the other Pete the Cat books. They're really groovy!